At Craft + Cocktails, I focus on fresh, organic + seasonal ingredients. They truly make a difference when it comes to the quality and flavor of your drink. That’s why when I came across the new Zen and Tonic book by Jules Aron, I knew I had to add it to my cocktail library ASAP. If you are a health food aficionado, cocktail maven, or perhaps a bit of both like me, this book is for you! 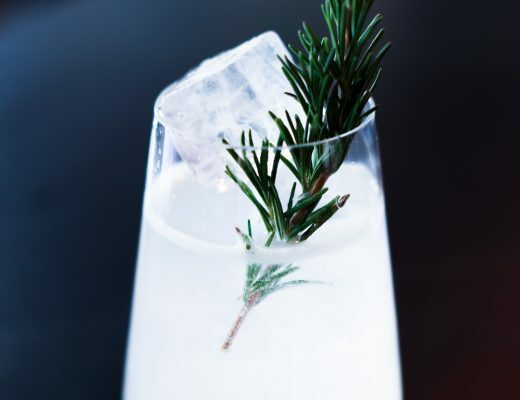 Jules Aron, aka The Healthy Bartender, is here to prove that healthy cocktails don’t have to be an oxymoron. Zen + Tonic features healthful ingredients in drinks like fresh produce, organic spirits, herbs + spices. Super fruits even make several appearances through out the pages. Utilizing good for you ingredients in cocktails, she promotes well being AND well made drinks- a win-win I say! There are around 100 wholesome cocktails featured in Zen + Tonic with ingredients like beats, turmeric, papaya + goji berries. Flipping through the book, the Secret Garden cocktail immediately stood out to me. The name alone drew me in and all the bright, floral ingredients seemed perfect and refreshing for the increasingly warmer days. 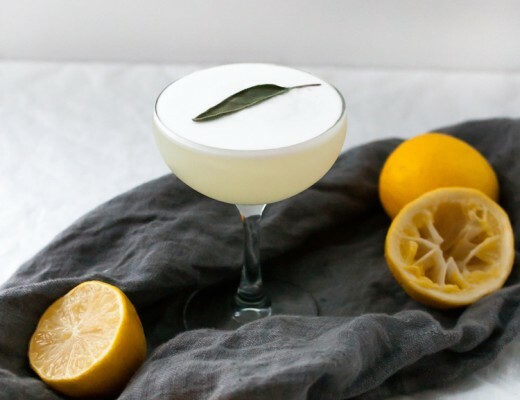 I can just picture myself wandering through a beautiful garden in the middle of spring with everything in full bloom, sweet jasmine wafting through the air as I sip on this vibrant cocktail. YUM! 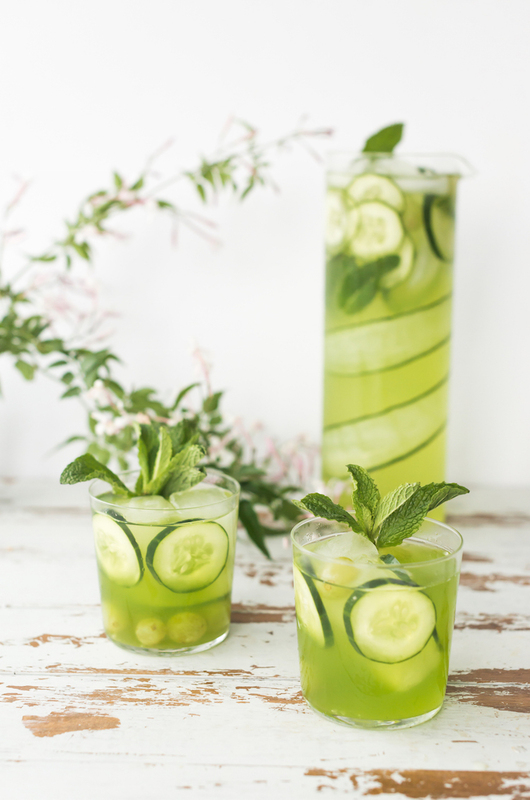 I love that grapes are used to keep the cocktail cool-as-a-cucumber. The grapes also help the cocktail from diluting too quickly during the warmer months. I used to eat frozen grapes during the summer when I lived in Florida, they made 100 degrees a bit more bearable! They are packed with vitamin C and B1, flavonoids, antioxidants, and potassium, and one of the best parts? Once you finish your drink (which was rather quickly for me) you’ll have a snack waiting at the bottom of your glass! This recipe makes enough for a pitcher (or about 8 servings). 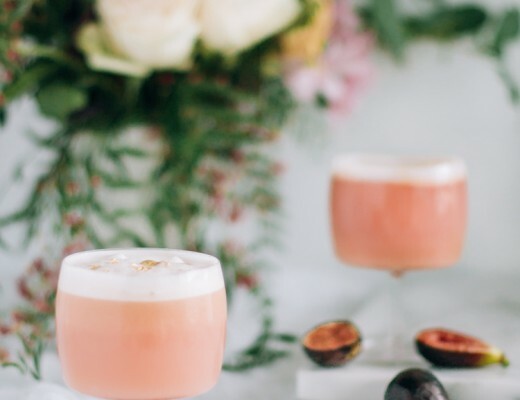 Gather some of you closest friends this spring for an al fresco happy hour and whip up these health-filled Secret Garden cocktails! Peel the rind off of the limes. Set the rinds aside. Cut all the limes in half. In a juicer, process the cup of cucumbers and the limes and strain through a fine mesh strainer into a pitcher. Stir in the jasmine syrup, hot water, lemon balm, mint + lime rinds. Let steep on the counter for a minimum of an hour. Strain out the herbs and lime rinds. Allow to cool. 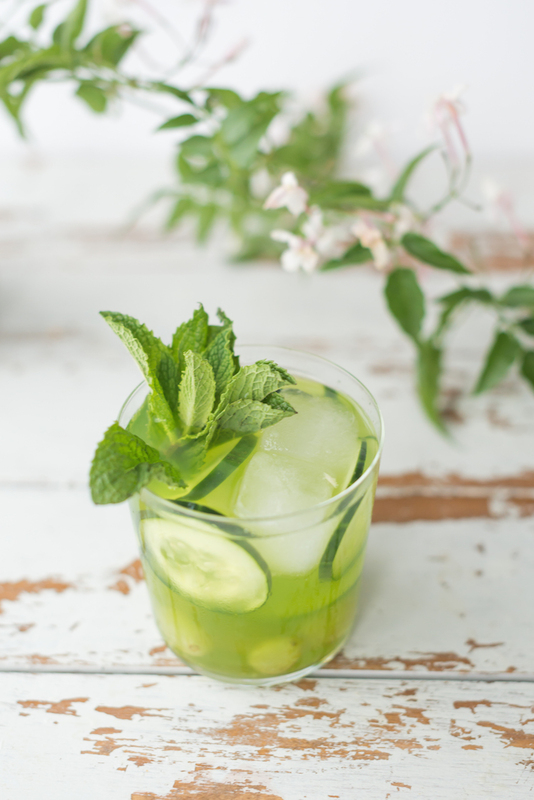 Add the gin, thin slices of cucumber, frozen grapes + garnish with the mint sprigs. Now, for the giveaway! 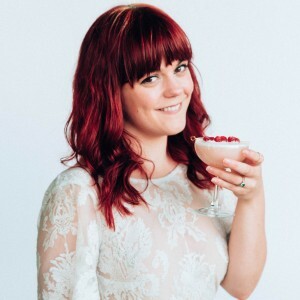 Jules and I are offering up a lot of cocktail goodies like a signed copy of the Zen & Tonic book as well as an engraved decanter from the talented Love & Victory (all prizes listed in the Rafflecopter). I so wish that I could win this one! 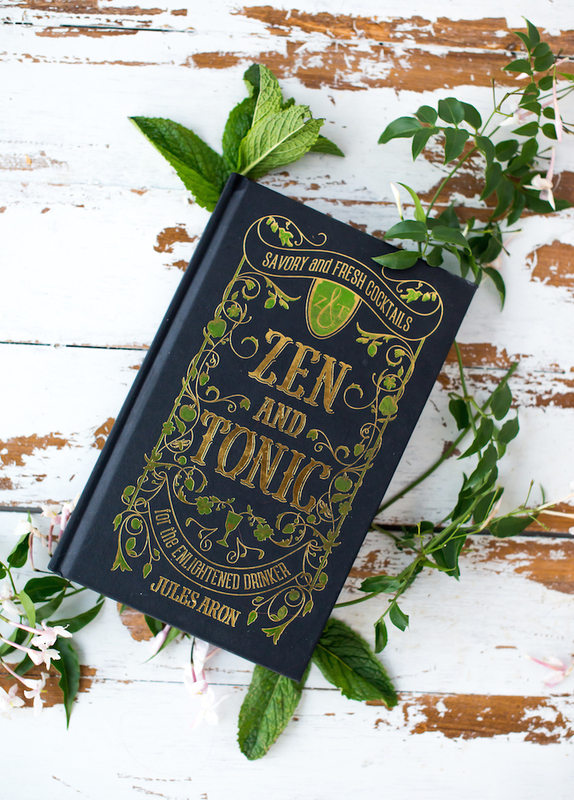 For more about Zen & Tonic, head to Jules Aron’s site here! Original photography and styling by Craft + Cocktails. Recipe via Jules Aron. Fine Print: No purchase necessary. Open to US residents only. Void where prohibited by law. Must be 18 years or older to enter. Sweepstakes starts 4/25/2016 at and ends 5/1/2016 All entrants must follow the actions in the Rafflecopter and leave a comment on this post to be eligible for the giveaway. Winners will receive the prizes listed in the Rafflecopter valued around $450. Entrants will be selected randomly via the Rafflecopter and after sweepstakes ends, the winner will be contacted by myself & Jules Aron to arrange shipment of the winnings. If the winner does not claim the prize, another winner will be re-selected. I love using fresh mint! Yes! It has such a lovely, bright aroma and used in so many classic cocktails. You can’t go wrong with mint! Fresh fruit or herbs from the garden! I love the freshness cucumber adds! Yum! 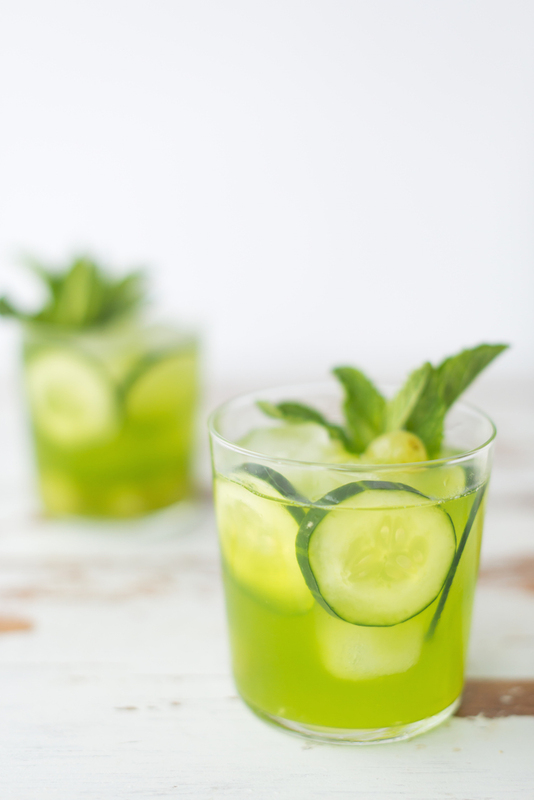 A Little muddled cucumber goes a long way in a cocktail! Sage is definitely under used in cocktails. I love it! I love the idea to use grapes instead of ice. Brilliant, right?! Will have to use that more often. Peaches forever! So underrated and goes with almost all base spirits. Nothing you can’t throw some peach in! I am (not so) patiently waiting for peach/stone fruit season to come around. I love peaches and basil in cocktails together! Do fresh eggs count as a favourite fresh ingredient? I love egg white in my gin and whiskey based drinks. Oh I enjoy the heck out of egg white cocktails! yum! My favorite fresh ingredients to use are watermelon and celery. They make fantastic savory summer cocktails! ooooh yes watermelon! I wonder if watermelon AND celery would go together? !